Pivotal Research’s Brian Wieser is one of Facebook’s biggest bears on Wall Street. He says Facebook is a mature company, and may be plateauing. 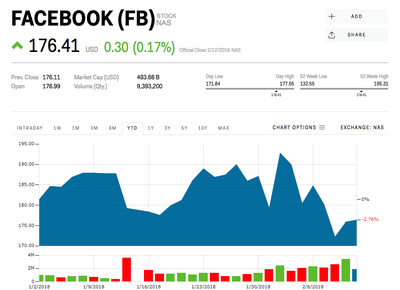 Facebook shares could get slashed considerably, says Pivotal Research Group analyst, Brian Wieser. Wieser, one of Facebook’s biggest bears on Wall Street, has a $US152 price target for the stock, about 16.5% below its current level of $US177. The Wall Street consensus is at $US224, according to Bloomberg data. “With every passing year, Facebook gets closer to the limits of growth,” Wieser told Business Insider. He says most mature companies hit a plateau and see lower margins. “Look at Google,” he added, comparing Facebook to the search giant, which is another mature tech company reliant on advertising revenue that may be plateauing. Google’s fourth-quarter profit margin was 24%, compared with 25% for the same quarters in 2015 and 2016. Wieser says, “Facebook is overvalued,” and that there are “limits on growth which the investor community doesn’t fully appreciate.” Those limits pertain directly to the advertising dollars that brands will want to spend on Facebook in the near future. Furthermore, Facebook has been in the thick of a public debate concerning fake news. That has caused huge brands like Unilever to think about scaling back their ad spending on the platform. But, according to Wieser, Unilever will continue its ad spending on Facebook if the company cleans up its content. “Unilever will stay the course so long as Facebook, Google and others continue to make efforts to improve their platforms,” he said. The advertising industry, however, doesn’t see those concerns as a real threat to Facebook’s ad revenue. There are few alternatives for marketers, many in the industry say. It is also potentially dangerous to a company’s brand to leave Facebook, which is home to some 2 billion users. Facebook shares are down 2.76% this year.